Published in the Dover Express, 8 February, 1980. Trevanion Street was a narrow thoroughfare leading from St James’s Churchyard to the sea. At the seaward end of the street was Trevanion House. That was modern; but near its site, and extending over land on the cliff side northwards, was the mansion of John Trevanion, who became a Dover resident and Freeman in 1769, when a vacancy occurred in the Parliamentary representation, owing the Hon George Villiers succeeding his father, the Earl of Jersey. Sir Pym Hales, Bart., and Mr John Trevanion fought for the seat, but on that occasion Trevanion was unsuccessful. Mr Trevanion’s local connection gave him a considerable hold on the Freemen; in fact, he secured a majority of the in-dwelling Freemen, and he petitioned the House of Commons to disallow the out-dwellers’ votes, but his petition failed. He tried again in 1773, and failed: but at a General Election, in 1774, he had another chance. He spent his money freely in that contest, thereby securing his election; and, as a thank-offering, he immediately established in Council House Street a school for fifty boys, which he maintained at his own cost for more than thirty years. It was during this period, from 1774 to 1806, that the Trevanion mansion was a centre of hospitality and political influence, Trevanion figured in a great patriotic meeting, summoned by the Lord Warden. Mr Pitt, at Dover Castle, in 1794, to raise means for National Defence, and he subscribed £100 to the fund. He fought contested elections in the Whig interest at Dover in 1769, 1773, 1774, 1780, 1784, 1785, 1790, 1796, 1802 and 1805, His last successful fight was In 1802, when he polled two-thirds of the constituency; but In 1806 he was beaten, and being then advanced in years, he left the arena. He died in 1810, and was buried m old St James's Church. At the time when the mansion of John Trevanion was in its glory, the land around it was pastoral, the area between Trevanion and Woolcomber Streets being occupied by Trevanlons "Home Farm." which later was called Harrison's," and the last holder of it was Mr Wilson Gates, who built on the site houses forming the west side of the seaward end of Trevanion Street. 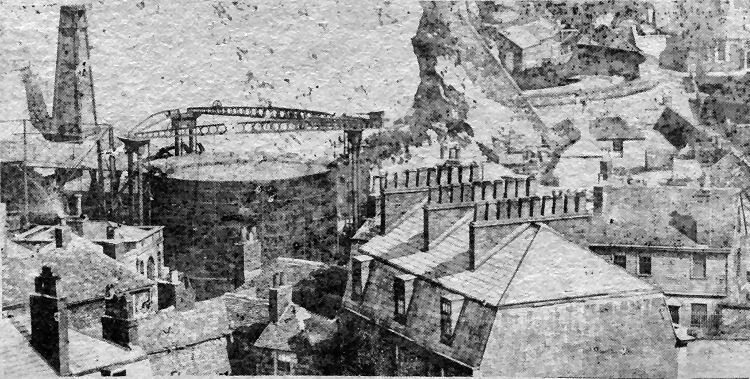 In 1822, part of the site of Trevanion’s mansion was used by the Dover Gaslight Company, who established their first works at that spot; and one of their gasometers occupied the site until 1911. Recollections of this first effort to illuminate the streets and houses of Dover by means of "Inflammable air,“ as it was quaintly termed in the Act of Parliament, are interesting, The Company, of which Mr Henshaw Latham was the first chairman, bravely tackled the novel undertaking with a capital of £10,000. Those old works were the scene, financially, of many struggles and so few triumphs that, after a quarter of a century's operations, the best thing they could do was to supply gas at 9s, (46p) per 1000 feet. There were several efforts at extension of the works. In 1853, Mr Nowers' premises, adjoining, were purchased for £1,000, and merged in the works. Two years later, the premises in Fector’s Place, adjoining St James's Street, were acquired; but the problem of increased production was not satisfactorily solved until the gas works were established at Buckland, in 1864. It was after the works were removed to Buckland that Trevanion House come into being serving as a reminder of the large Trevanion mansion which made that locality famous. Pictured above is the original Trevanion Street gas works. Viewed from the top of the churchyard, just below Castle Hill Road, this is how St James’s Church is believed to have appeared some years before the neglect and vandalism which led to is restoration in 1868-9. 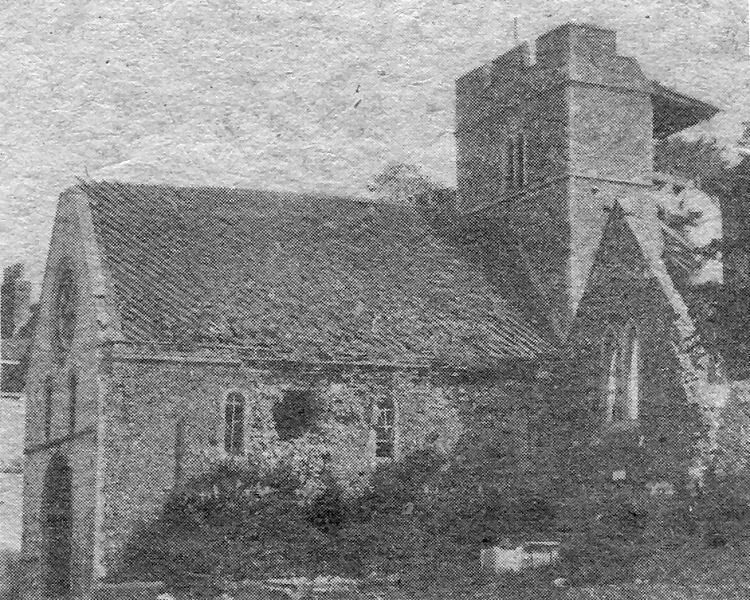 The picture shows the state of the church after the first shelling damage of the Second World War. Had there been no further damage there might have been hope of a post-war restoration, but later damage made this out of the question.